Betrayal is hard to take, whether in our personal lives or in the political life of the nation. Yet there are people in Washington -- too often, Republicans -- who start living in the Beltway atmosphere, and start forgetting those hundreds of millions of Americans beyond the Beltway who trusted them to do right by them, to use their wisdom instead of their cleverness. 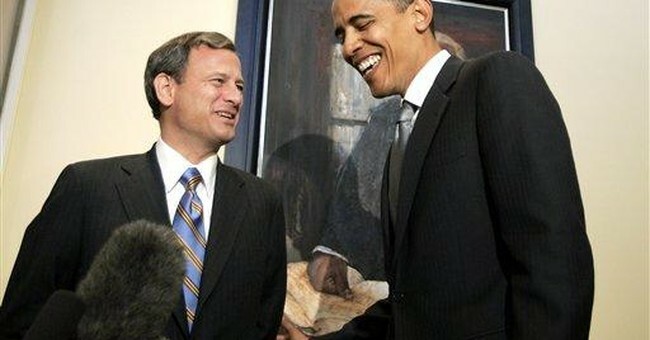 Chief Justice John Roberts need fear no such fate because he has lifetime tenure on the Supreme Court. But conscience can be a more implacable and inescapable punisher -- and should be. John Roberts is no doubt a brainy man, and that seems to carry a lot of weight among the intelligentsia -- despite glaring lessons from history, showing very brainy men creating everything from absurdities to catastrophes. Few of the great tragedies of history were created by the village idiot, and many by the village genius. Who he betrayed were the hundreds of millions of Americans -- past, present and future -- whole generations in the past who have fought and died for a freedom that he has put in jeopardy, in a moment of intellectual inspiration and moral forgetfulness, 300 million Americans today whose lives are to be regimented by Washington bureaucrats, and generations yet unborn who may never know the individual freedoms that their ancestors took for granted. Some claim that Chief Justice Roberts did what he did to save the Supreme Court as an institution from the wrath -- and retaliation -- of those in Congress who have been railing against Justices who invalidate the laws they have passed. Many in the media and in academia have joined the shrill chorus of those who claim that the Supreme Court does not show proper "deference" to the legislative branch of government.